A new Listener setter this week, although he does have a couple of C-grade Magpies to his name. I didn’t (and still don’t) know whether this pseudonym is taken from one of the kings of Babylon in days BC, or a 15-litre bottle of champagne. An intriguing method of revealing the message this week — an extra word with the letters either side of it spelling out two instructions. Some clashes and all occurrences of the letter K (!) 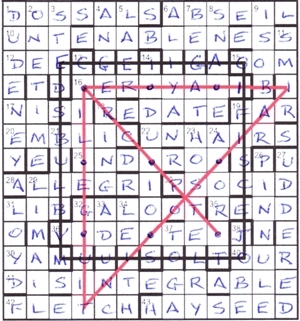 needed special treatent according to one, and a unique solution to the puzzle would be indicated by the second. 16 other clues had wordplay omitting one or two letters, the missing letters giving a related phrase. I started off fairly well, with 6ac ABSEIL and 10 UNTENABLENESS, the latter Indefensibility of exotic dancer Anne’s new blue set (13) helped by the ABLE and NESS standing out in ANNE’S N BLUE SET (oh, and the UN- too). All this meant that I reckoned to be finished within the hour. Famous last words, of course, since the extra words (which were only in 30 clues) seemed cunningly hidden. Moreover the missing wordplay letters weren’t easy to identify either. I suppose the most tricky was 17 Effective failing condition, too, after shift — back by six! (4) where the exclamation mark was truly warranted — TOO shifted back in the alphabet by 6 to give NI[S]I. And then there was 14dn Once true life account [filmed] in river holds Universal certificate (9) for INDUBIOUS — BIO in INDUS containing U. I wasn’t helped by thinking that the life account would be BIOG, but finally Mrs B helped with that although it still needed an age to identify the Indus. All in all, a tough solve, certainly in excess of four hours. [Nearer five, I suspect. Ed.] I hoped the endgame would be slightly easier without too much grid-staring. Of course, the two wordplay-only cues, DUDENEY and LOYD, the two puzzle-smiths at 1dn and 31dn, didn’t hold out much hope for that. The two instructions spelt out Replace with dots for the clashes and the letter K (just one), and Connect with four straight lines without lifting pen. The EGG OF COLUMBUS was the way in for me, although my first googling indicated that it was a way of standing an egg upright on its smaller end. Eventually, the way of connecting the nine dots without lifting the pen off the paper revealed itself and all was sorted. I found this a truly enjoyable, taxing and satisfying puzzle. Many thanks, Nebuchadnezzar. This entry was posted on 1 December 2017 at 4:00 pm	and is filed under Solving Blogs. Tagged: His, Nebuchadnezzar. You can follow any responses to this entry through the RSS 2.0 feed. You can leave a response, or trackback from your own site. What wonderful graphics again (though clearly you have been investing in those IKEA scissor sets!) I think the title had us all mystified but watch this space. I believe Nebuchadnezzar is going to explain it in a setter’s blog. Thanks, Shirley. You’ll be pleased to know that the scissors came in a pack of 20 (or was it 50? ), so plenty more scope for future blogs!